The concept of involving citizen groups in the collection of long-term ecological baseline data is a relatively new idea for British Columbia. Currently, the demand for these data is on the increase, while the financial capacity and human resources of the traditional agencies collecting ecological data appears to be in long-term decline. As community-based ecosystem monitoring has become a partial solution to this dilemma in other jurisdictions, the Board of Directors of FORREX–Forest Research Extension Partnership felt it was appropriate to conduct a preliminary investigation, with recommendations on a potential extension role for the Partnership. Patrick Yarnell, an environmental planning and management consultant from Vancouver, had the right combination of knowledge and expertise for the project, and was contracted in the fall of 2001 to research and write a preliminary report to submit to the Board. This is the final report, after editorial review and comment. 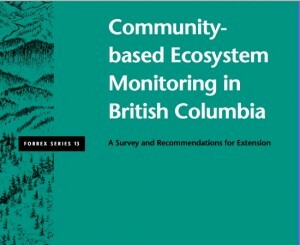 Although some of the information and recommendations are specific to FORREX, the Board felt there was sufficient interest in community-based ecosystem monitoring to make this report available to a wider audience. Funds to support this project came from the Province of British Columbia.